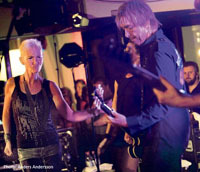 Written by Roxwriter on July 16, 2010 to Roxette. Following Wednesday night's appearance of "It Must Have Been Love" on Australia's national countdown clip show "20 to 1" Australian cable (Foxtel) channel MusicMAX aired a 33 minute "Best of: Roxette" special on Thursday 15th July at 10.30 pm (AEST). - "It Must Have Been Love"
- "Listen To Your Heart"
- "Milk and Toast and Honey"
Basically these are the only Roxette videos they have in their archive. They are missing the obvious hits and this reporter urges all Aussie Roxette fans to mail MusicMax and ask them for "Dangerous", "Fading Like a Flower", "How Do You Do! ", "Sleeping in My Car", "The Big L", "Spending My Time", "Wish I Could Fly", "Run To You", "Crash Boom Bang" and "Almost Unreal". Jophesine77 contributed to this article. Written by Mr_Sandman on July 13, 2010 to Roxette.